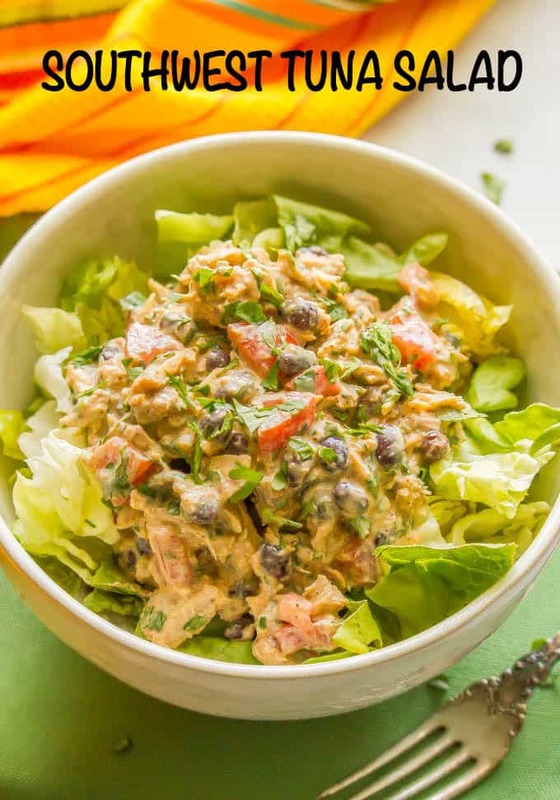 Southwest tuna salad with black beans, tomato and cilantro is a great healthy lunch recipe with tons of protein and southwestern spices. It takes just 10 minutes to make and can be served as a sandwich, wrap or lettuce wrap, as a salad, or stuffed in an avocado or tomato. Today is J’s last day of 4-year-old preschool. He has a little graduation ceremony tonight with his class and they sing a little song. So while it’s been a major year of growing up for him, I’m not yet staring down the end of preschool and the start of kindergarten. M’s last day of 1st grade is Friday and then they are both off for the summer! I’m excited about having some fun afternoons together, and I’m hoping this weekend starts us off strong! Enough rambling from me though – let’s dive into this deliciousness! I’ve probably mentioned at least a dozen times how we are always trying to eat more seafood in our house. They recommend at least two servings of seafood a week and salmon is on the menu for dinner about once a week. (Such as the honey lime salmon and easy BBQ salmon recipes I just shared this past week.) And I often try to squeeze in a second seafood serving at lunch. 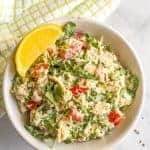 My tuna spinach salad is a long-time favorite, and I recently started making this southwest tuna salad for a fun, new twist! I obviously love southwest flavors. 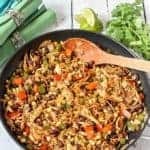 My southwest vegetarian quinoa skillet, southwestern chopped salad and southwest chicken skillet dinner are some of just many here on this blog! 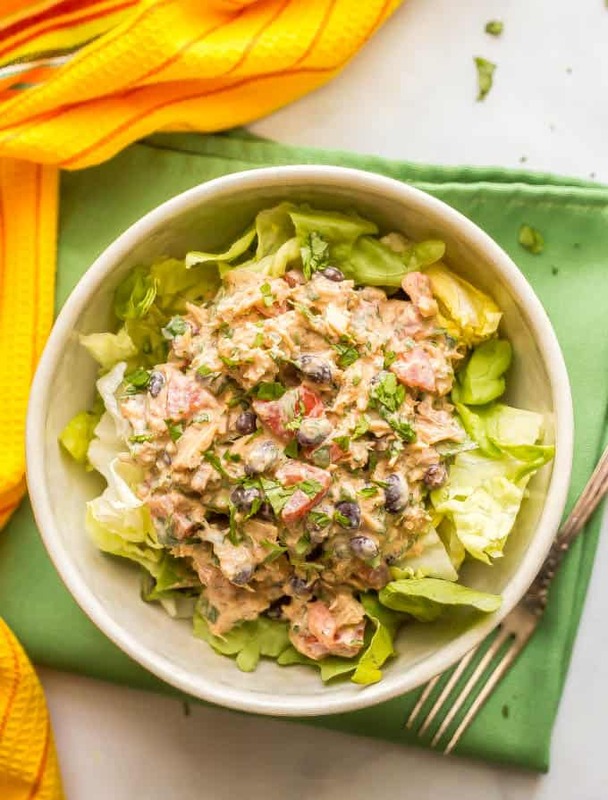 And today I’m taking some of those same favorite flavors, ingredients and spices to this southwest tuna salad. ❤️ It’s got just the right amount of creaminess and is loaded with protein! Plus, there’s tons of other additions you can mix in and different ways to serve it. 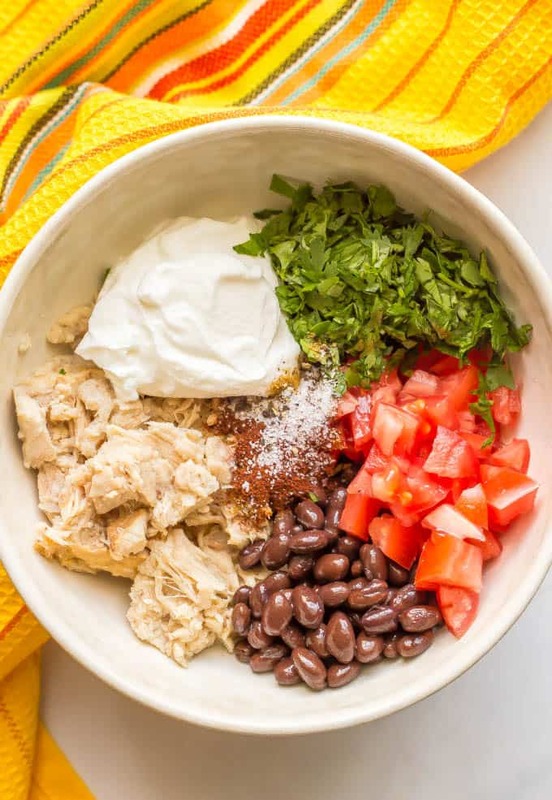 I use all Greek yogurt for this recipe, but you could certainly use mayonnaise or half mayo and half Greek yogurt if you prefer. You could also add a small (4 oz.) can of diced green chilies for some extra fun flavor. Want to add a little spicy twist? You can add a finely diced jalapeño pepper to the salad, or sprinkle in a bit of cayenne pepper. Or top it with a few dashes of hot sauce or a drizzle of sriracha. 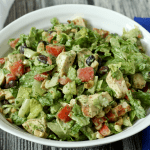 You can add in diced avocado or top this salad with sliced avocado. 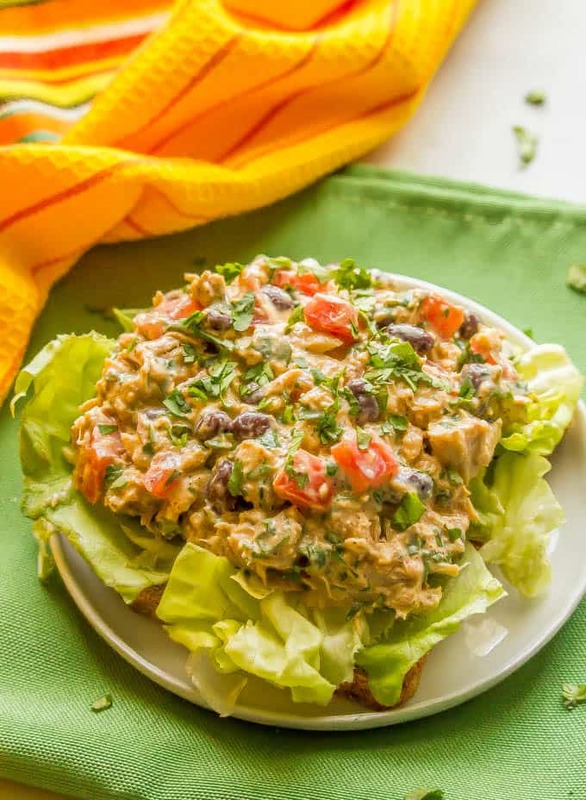 You could even serve it in a partially scooped out avocado for a tuna salad avocado boat! In the summertime, you could also serve this stuffed into a hollowed out ripe heirloom tomato. 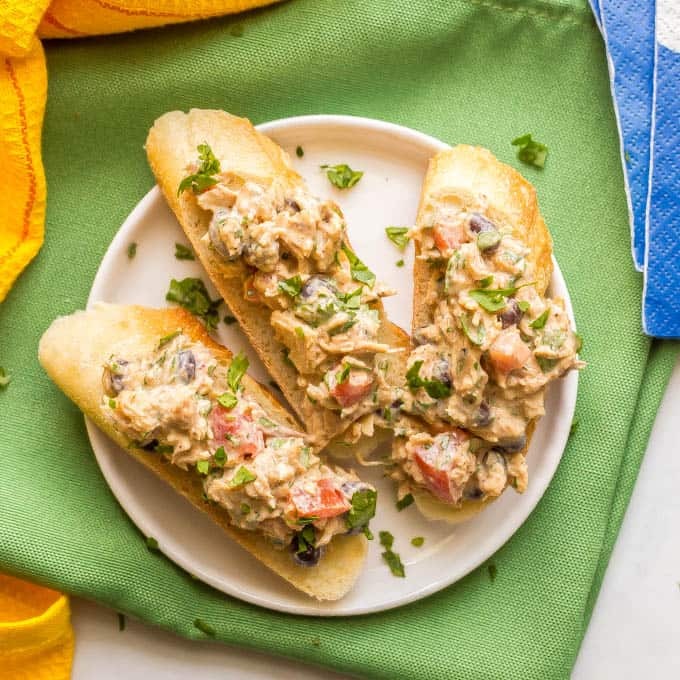 My go-to ways to serve this are as a southwest tuna salad sandwich, in a whole wheat wrap or a lettuce wrap or on baguette slices for an appetizer. Sometimes I just scoop it over some mixed greens or Bibb lettuce and eat it as a salad. Want to make this ahead? 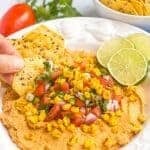 It’s a great meal-prep recipe but I suggest adding the cilantro and the fresh lime juice when you’re ready to serve it. That way they can add a pop of freshness and brightness after it’s been sitting in the fridge. 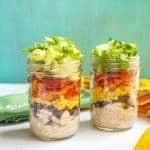 I hope this gives you a new fun and healthy lunch to try! 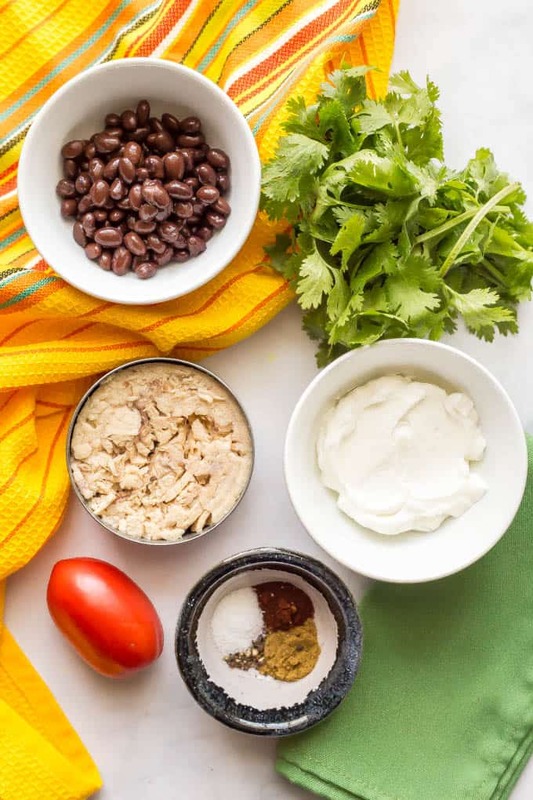 Southwest tuna salad with black beans, tomato and cilantro is a great healthy lunch recipe with tons of protein! Combine all ingredients in a medium bowl and stir until well mixed. All done! 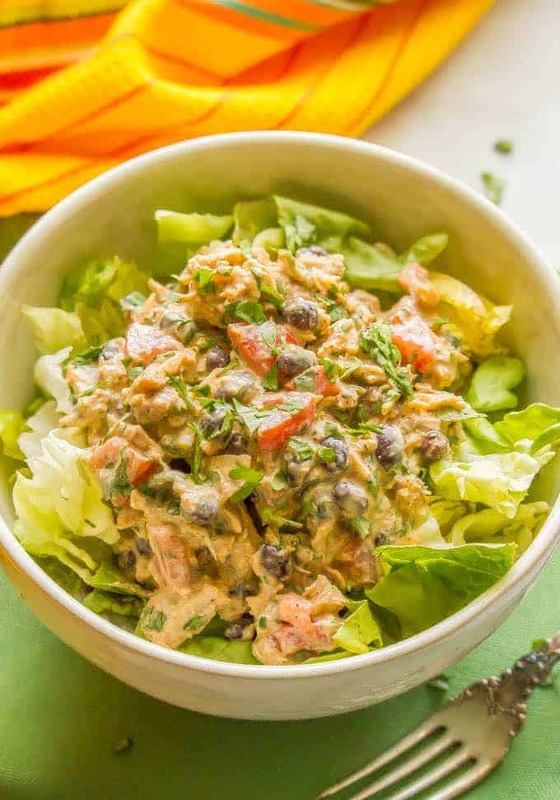 Serve as a sandwich, wrap or lettuce wrap, as a salad over mixed greens, as an appetizer on baguette slices, or stuffed into an avocado or tomato. You could also add a small (4 oz.) can of diced green chilies. Want to add a little spicy twist? You can add a finely diced jalapeño pepper to the salad, or sprinkle in a bit of cayenne pepper or top it with a few dashes of hot sauce or a drizzle of sriracha. You can add in diced avocado or top this salad with sliced avocado. Want to make this ahead? 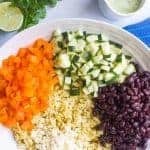 It’s a great meal-prep recipe but I suggest adding the cilantro and the fresh lime juice when you’re ready to serve it so they can add a pop of freshness and brightness after it’s been sitting in the fridge.